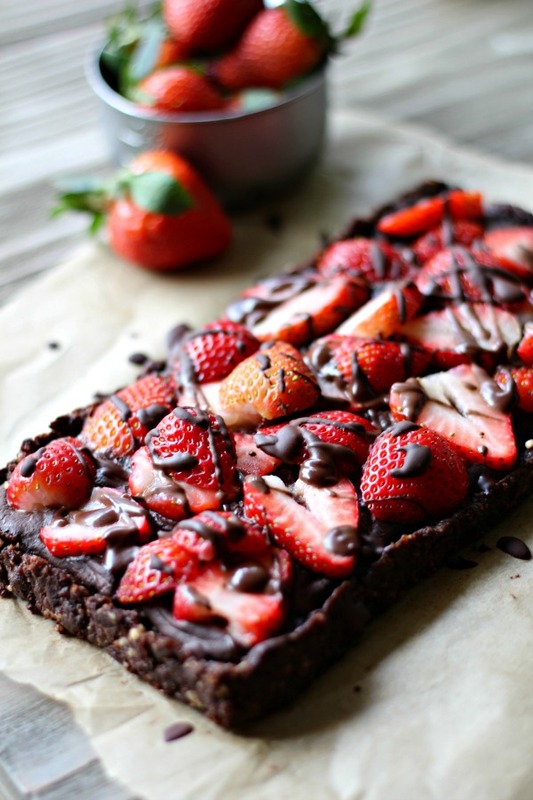 No Bake Chocolate Strawberry Tart. 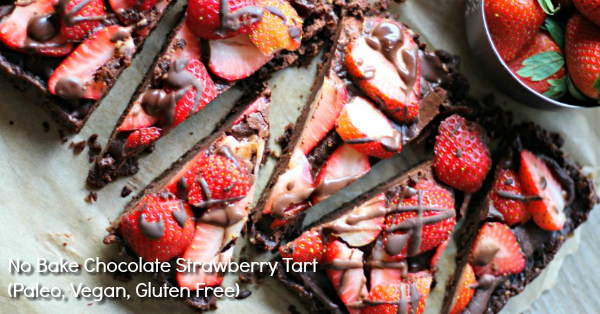 Easy to make and so decadent and delicious – perfect for chocolate lovers! 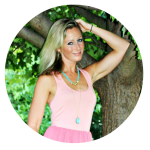 Vegan, Gluten Free and Paleo Friendly recipe. For all of you fellow chocolate lovers out there, this one is for you! 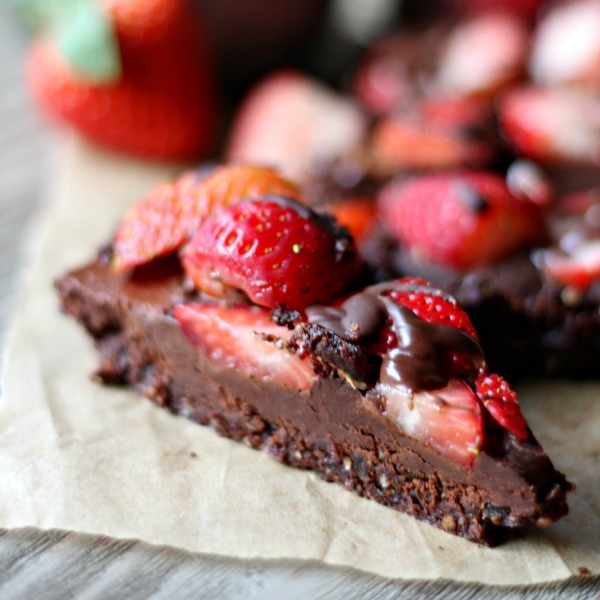 This No Bake Chocolate Strawberry Tart is oh-so-decadent, irresistibly good, absolutely gorgeous and surprisingly….extremely simple! This recipe takes just 10 minutes to make with only a handful of ingredients. It has a gooey brownie crust layer that’s made very simply with blended nuts and dates. And then there’s an easy chocolate ganache layer made with your favorite melted chocolate bar. Next comes a layer of red, delicious and ripe, juicy strawberries. And finally, some more melted chocolate is drizzled all over the top. Swoon. 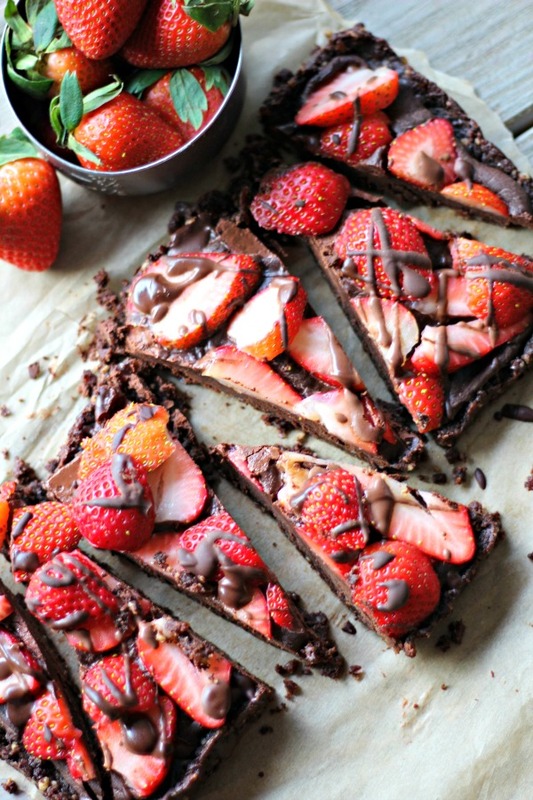 It’s like a triple chocolate strawberry treat….oh baby, oh baby! 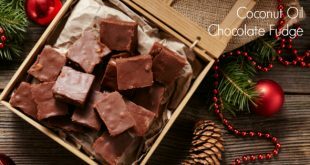 If you adore a rich, decadent chocolate treat like me, I think you’ll especially enjoy this recipe! 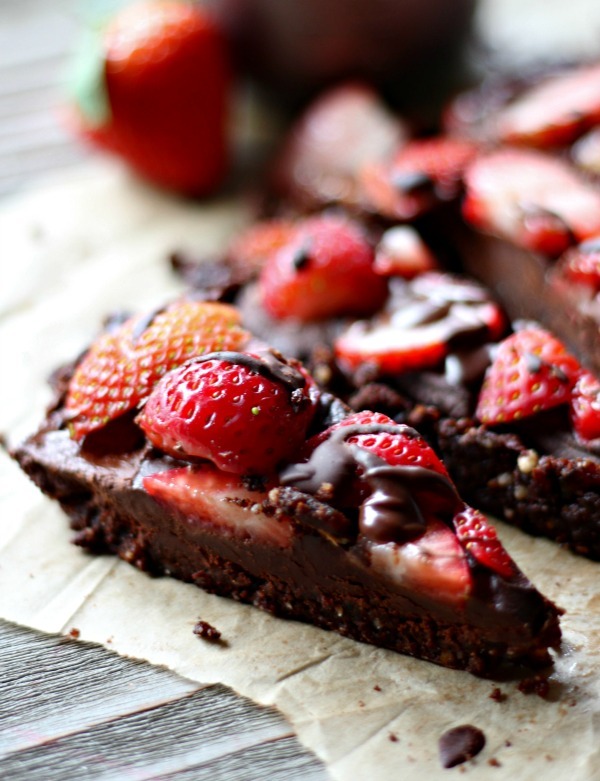 No Bake Chocolate Strawberry Tart. Makes a great Valentine's Day celebration treat! It's easy to make and incredibly rich and delicious - perfect for chocolate lovers! 2 (3-ounces each) of your favorite dark chocolate bars (THESE are my fav!) or to switch it up, you can use white chocolate bars, too! Add pitted dates, nuts, cacao powder, vanilla and sea salt to a high powered blender and blend until the mixture is finely chopped and clumped together. Press the date/nut mixture into the bottom and a little up the sides of a parchment lined 4"x8" loaf pan to form a crust. Set aside. Meanwhile, break up the dark chocolate bars, add them and your milk in a small pot over medium heat, stirring occasionally. Allow the chocolate to melt until it's completely smooth. Pour the melted chocolate over the date/nut crust, reserving a bit of chocolate to drizzle over the top of the strawberries, if desired. Add your sliced strawberries on top of the melted chocolate layer and then drizzle any remaining melted chocolate over the strawberries. 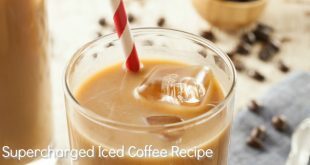 Refrigerate for at least 45 minutes, slice and enjoy! 🙂 Store leftovers in fridge. I had to laugh when I looked up the chocolate bars…that is one of my favorite brands too. Not only do I love the chocolate, I’m a sucker for cute packaging. This tart sounds amazing. 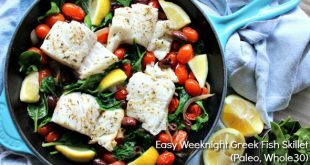 And wanted to let you know I making making your Greek fish skillet AGAIN tonight. It’s that good! The fact that it is so easy doesn’t hurt either. I love all their flavors, Elizabeth…especially the mint chocolate! That’s my go-to one 🙂 So glad you are liking the Greek Fish Skillet, too! Thanks for this recipe. Loved it. Looks so yummy. 🙂 Thanks for the comment, Vidya! Thanks again for your support and for reading – it means a lot to me! 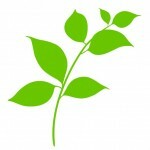 And many blessings to you on your health journey! I made this last week. I must say it is beyond wonderful. Mine even turned out as pretty as yours. Thanks for the great recipe! This makes me so happy to hear, Pam! What a wonderful post. This recipe looks amazing. My mom just looked over my shoulder and drooled at your photos. I think we might try to make it while I am here visiting. Thank you, Alex! What a fun thing to do with your mom – I hope you both enjoy it! How far in advance can you make this? Wonder if the strawberries will make it too moist/mushy? Could it be made the night before use? 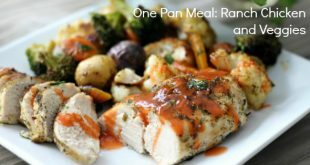 I make it the night before and it’s always come out great – no mushy issues! Sometimes I have some leftover and it’s fine the next day, too.